Part-Whole Concept and the Change Concept . The Singapore Math Primary Curriculum adopts a concrete-pictorial-abstract progressive approach to help pupils tackle seemingly difficult and challenging word problems. 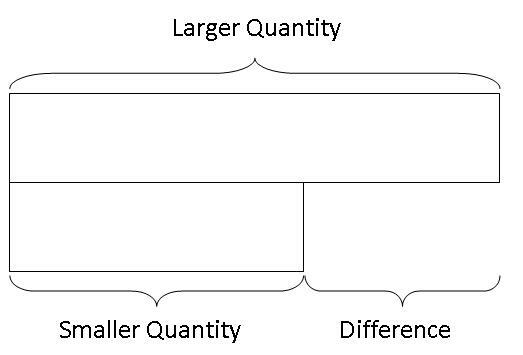 Mathematics Teachers in Singapore usually make use of concrete objects to allow students to make sense of the comparison concept by comparing two or more quantities. 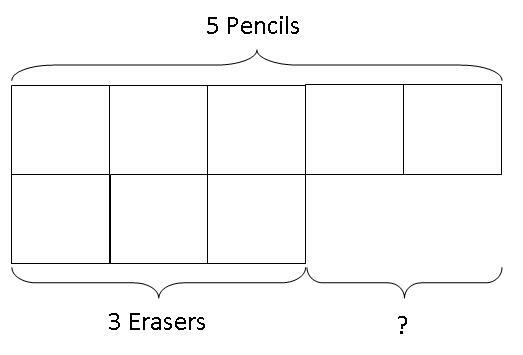 Once the pupils can visualize how much one quantity is greater than or smaller than another quantity, they will then move on to put these relationships in rectangular bars as pictorial representations of the math models concerned. Peter has 5 pencils and 3 erasers. How many more pencils than erasers does he have? 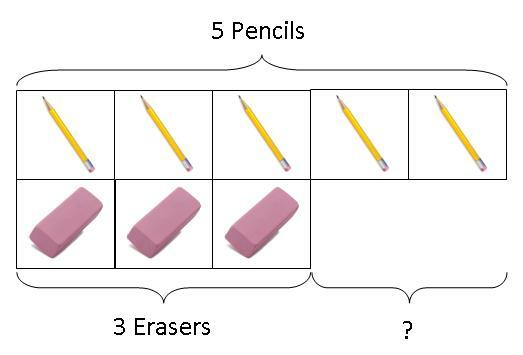 We can first give the child concrete objects, like 5 pencils and 3 erasers, and let the child put the two groups of objects side-by-side to match the 2 types of items, i.e., 1 pencils match with 1 eraser. 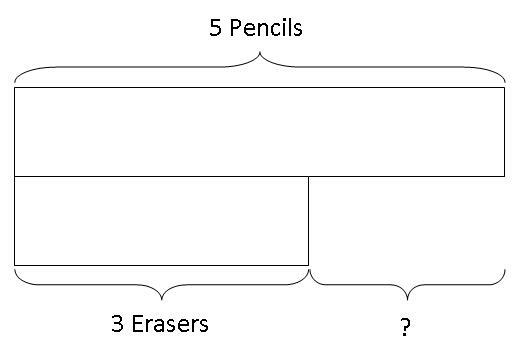 Then, he will be able to see that there are 2 more pencils which cannot be matched with any erasers because he has run out of erasers to do that. Eventually, the equation can be visualised as a comparison between the 2 quantities given in the question and the pupils can easily see that to find the difference, they just need to subtract the smaller quantity from the larger quantity. Therefore, Peter has 2 more pencils than erasers.